Solving the mysteries in the Joe Leaphorn and Jim Chee novels relies heavily on the specific landscape and environment of the American Southwest. 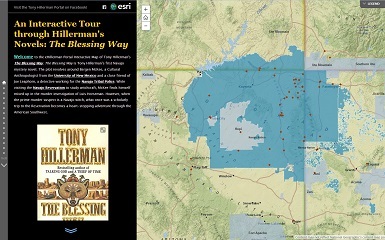 Tony Hillerman always pays significant attention to setting in his works, and this mapping tool can further that focus on location by allowing students and researchers to digitally explore the areas traveled by his characters. The geographic setting for the majority of Hillerman's novels is the Four Corners region of the Southwest, near Shiprock, New Mexico and the Navajo Nation within Arizona and extending into southeastern Utah. Each of these maps details the primary locations mentioned in each novel and includes both human built and natural features and locations. The maps allow panning and zooming and can be viewed in full screen mode. Many of the mapped location can be cross-referenced with the Encyclopedia and the interactive content within the Manuscript Viewer. This map includes a guided tour through each chapter of "The Blessing Way," and displays the major southwestern geographic references mentioned in the novel. It includes locations in Arizona, New Mexico and Utah, as well as several fictional locations that Tony Hillerman made up for the novel. Click on the thumbnail image to open the map in your browser and start the tour. Click the up or down arrows to advance through the tour, or click on a map marker to see a brief description of the location. Mapped Locations for "Dance Hall of the Dead"
This map displays the major southwestern geographic references mentioned in the novel, "Dance Hall of the Dead." It includes locations in Arizona and New Mexico. Click on each map marker to see a brief description of the location. Scroll or zoom the map using your mouse, or click the square icon in the top right corner of the map to view it in full screen mode. Mapped Locations for "People of Darkness"
This map displays the major southwestern geographic references mentioned in the novel, "People of Darkness." It includes locations in Arizona and New Mexico. Click on each map marker to see a brief description of the location. Scroll or zoom the map using your mouse, or click the square icon in the top right corner of the map to view it in full screen mode. Mapped Locations for "The Ghostway"
This map displays the major southwestern geographic references mentioned in the novel, "The Ghostway." It includes locations in Arizona and New Mexico, as well as several fictional locations that Tony Hillerman made up for the novel. Click on each map marker to see a brief description of the location. Scroll or zoom the map using your mouse, or click the square icon in the top right corner of the map to view it in full screen mode. Mapped Locations for "A Thief of Time"
This map displays the major southwestern geographic references mentioned in the novel, "A Thief of Time." It includes locations in Arizona and New Mexico. Click on each map marker to see a brief description of the location. Scroll or zoom the map using your mouse, or click the square icon in the top right corner of the map to view it in full screen mode.